Deep Impact Sees Tempel 1 - Solar System Planets And Moons Section. Deep Impact Sees a Burst from Tempel 1. Artist illustration of Deep Impact with Comet Tempel 1. Image credit: NASA/JPL. NASA's Deep Impact spotted an outburst of ice and gas from the surface of Comet Tempel 1, which has been turned into a short animation of several frames. This is the second outburst Astronomers have seen from the Comet this month, and gives Astronomers a great opportunity to fine tune instruments in space and here on Earth to get the most science out of the July 4 "encounter". NASA's Deep Impact spacecraft observed a massive, short-lived outburst of ice or other particles from Comet Tempel 1 that temporarily expanded the size and reflectivity of the cloud of dust and gas (coma) that surrounds the Comet nucleus. The outburst was detected as a dramatic brightening of the Comet on June 22. It is the second of two such events observed in the past two weeks. A smaller outburst also was seen on June 14 by Deep Impact, the Hubble Space Telescope and by ground based observers. "This most recent outburst was six times larger than the one observed on June 14, but the ejected material dissipated almost entirely within about a half day," said University of Maryland College Park Astronomer Michael A'Hearn, principal investigator for the Deep Impact mission. A'Hearn noted that data from the spectrometer aboard the spacecraft showed that during the June 22 outburst the amount of water vapor in the coma doubled, while the amount of other gases, including carbon dioxide, increased even more. A movie of the cometary outburst is available on the Internet at http://www.nasa.gov/deepimpact. "Outbursts such as this may be a very common phenomenon on many comets, but they are rarely observed in sufficient detail to understand them because it is normally so difficult to obtain enough time on Telescopes to discover such phenomena," A'Hearn said. "We likely would have missed this exciting event, except that we are now getting almost continuous coverage of the Comet with the spacecraft's imaging and spectroscopy instruments." Deep Impact co-investigator Jessica Sunshine, with Science Applications International Corporation, Chantilly, Va., agreed that observing such activity twice in two weeks suggests outbursts are fairly common. "We must now consider them as a significant part of the processing that occur on comets as they heat up when approaching the sun," she said. Comet Tempel 1 is near perihelion, or the point in its orbit at which it is closest to the Sun. "This adds to the level of excitement as we come down to the final days before encounter," said Rick Grammier, Deep Impact project manager at NASA's Jet Propulsion Laboratory, Pasadena, Calif. "But this Comet outburst will require no modification to mission plan and in no way affects spacecraft safety." 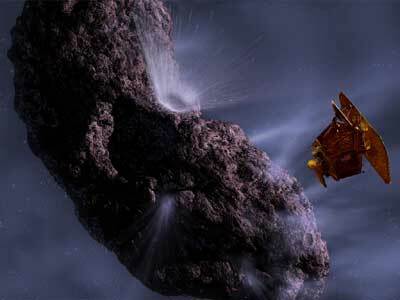 Deep Impact consists of a sub-compact-car-sized flyby spacecraft and an impactor spacecraft about the size of a washing machine. The dual spacecraft carries three imaging instruments, two on the flyby spacecraft and one on the impactor. A spectrometer on the flyby spacecraft uses the same telescope as the flyby's high- resolution imager. The final prelude to impact will begin early on July 3, 24 hours before the 1:52 a.m. EDT July 4th impact, when the flyby spacecraft releases the impactor into the path of the comet. Like a copper penny pitched up into the air just in front of a speeding tractor-trailer truck, the 820-pound impactor will be run down by the comet, colliding with the nucleus at a closing speed of 23,000 miles per hour. scientists expect the impact to create a crater several hundred feet in size; ejecting ice, dust and gas from the crater and revealing pristine material beneath. The impact will have no significant affect on the orbit of Tempel 1, which poses no threat to Earth. Nearby, Deep Impact's "flyby" spacecraft will use its medium and high resolution imagers and Infrared spectrometer to collect and send to Earth pictures and spectra of the event. The Hubble and Spitzer Space Telescopes, the Chandra X-ray Observatory, and large and small Telescopes on Earth also will observe the impact and its aftermath. The University of Maryland, College Park, conducts overall mission science for Deep Impact that is a Discovery class NASA program. NASA's Jet Propulsion Laboratory handles project management and mission operations. The spacecraft was built for NASA by Ball Aerospace and Technologies Corporation, Boulder, Colo.